Born on the island of Crete, El Greco was trained as an icon painter. In 1567 he moved to Venice where the tradition of Venetian coloring and facture, expressed in the art of Titian, Tintoretto and Veronese, inspired him. El Greco courted patronage from the Church in Rome, and later when he moved to Spain from the royal court of Madrid, with limited success. In the Spanish city of Toledo however, he discovered an enthusiastic audience for his religious images and portraits. No other artist painted like El Greco. Explanations for his audacious use of color, erratic light effects, and elongated figures have included an innate spiritual mysticism, personal eccentricity, and even visual aberrations. His singular approach to portraiture is evident in this depiction of his brother Manusso (c. 1529–1604), a mariner by profession. 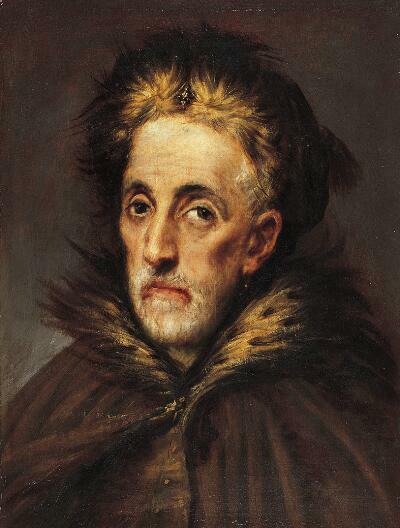 Though El Greco’s palette is restrained, a convention for male portraiture of this period, his brother’s attenuated features, take on an otherworldly character thanks also to the robust brushwork employed to describe the stiff fur collar and cap, and Manusso’s unfocused, ruminative aspect. Barone Michele Lazzaroni, Modena and Paris.